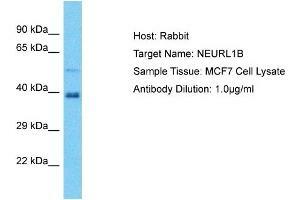 Characteristics This is a rabbit polyclonal antibody against NEURL1B. It was validated on Western Blot. Background NEURL1B is an E3 ubiquitin-protein ligase involved in regulation of the Notch pathway through influencing the stability and activity of several Notch ligands. Buffer Liquid. Purified antibody supplied in 1x PBS buffer with 0.09 % (w/v) sodium azide and 2 % sucrose. Precaution of Use This product contains Sodium azide: a POISONOUS AND HAZARDOUS SUBSTANCE which should be handled by trained staff only. Handling Advice Avoid repeat freeze-thaw cycles. Storage Comment For short term use, store at 2-8°C up to 1 week. For long term storage, store at -20°C in small aliquots to prevent freeze-thaw cycles.